Image caption Leo Varadkar was addressing concerns about surgical abortions raised in the Dail (parliament). It follows a landslide vote in favour of repealing the Republic of Ireland's constitutional ban on abortion in May. The government is drafting legislation that will allow for any woman to request an abortion up to 12 weeks, subject to a cooling off period, and will allow abortion in extreme cases between 12 and 24 weeks. 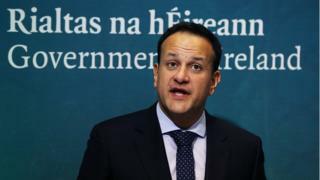 The taoiseach said the legislation would follow the model of the Protection of Life During Pregnancy Act 2013, which allowed for terminations in extreme medical circumstances, and allow individual medics to opt out. "It will not, however, be possible for publicly-funded hospitals, no matter who their patron or owner is, to opt out of providing these necessary services which will be legal in this state once this legislation is passed by the Dáil and Seanad (senate)," he added. "I'm happy to give you that assurance."